Pay 1 less to retreat Arcanine for each Energy attached to Arcanine. 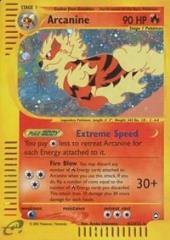 You may discard any number of Fire Energy cards attached to Arcanine. If you do, flip a number of coins equal to the number of Fire Energy cards you discarded in this way. This attack does 30 damage plus 30 more damage for each heads.